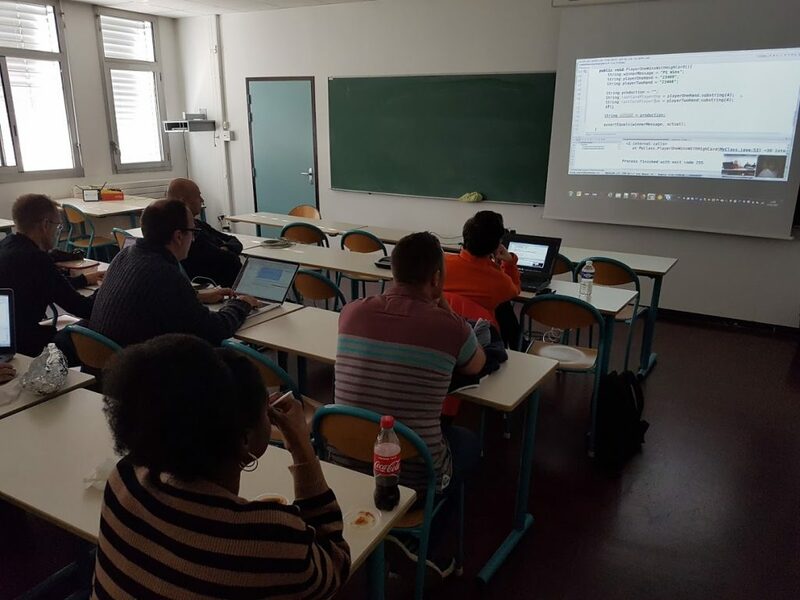 At SoCraTes France I paired with Rémy and Johan to show them how I code using TDD as if you Meant It. We had a few hours to try it, and then Rémy told me he would like me to present this to the Grenoble Software community. So this is how we arranged a remote live coding session on TDD as if you Meant It. During this session I am using Poker Hands as a problem, and I start with the usual Think-Red-Green-Refactor and Behavior Slicing. Then a lot of refactoring is going on. I invite you to watch the video and come with questions and improvement ideas. At the end of the remote live coding session we had a remote discussion about what happened. Here is in form of Q&A. Question: When you want to show the duplication to be sure it is not accidental, you try to duplicate three times the same code. Do we need to do this when we do just copy/paste? It doesn’t really help the tests. Answer: The fact that you can duplicate the test it shows it is easy enough and we don’t necessarily use the Rule of Three. But there are other cases when it’s more complicated and just duplicating the tests would not show the same. And there is still some duplication that doesn’t prove in the production code. We find that it’s not really the same behavior, and it’s often a surprise. The fact that I can make the duplication the third time is just making the point that we need to remove the duplication. Otherwise I need to search for duplication in another way. Question: It seems that we create these tests just to follow the Rule of Three, not because we want to. Answer: I don’t want to create the tests just to follow the constraint of The Rule of Three, I just want to be sure enough that what I am doing is on the good path. I don’t want to rush into refactoring. It is a question of how well you know your domain and how much you trust your instincts. The TDD as if you Meant It comes with the idea you don’t trust your instincts and you need proof. Question: If you want to create some duplication, we can use parametrized tests. Answer: Yes, for the tests that are duplicated we can use parametrized tests and compress the code. And probably at the end there will be very little code. Answer: Yes, but most of the problems I see that people fail to respect the rules and don’t find a way to respect the rules. But of course, there are very different styles. Some go very functional, some like to use more state, I go in very small steps. I like to go in very small steps and focus on triangulation. I like to use it as a machine that is generating duplication in all these tests and then because I have duplication, I extract the methods and the classes. You do need to refactor a lot. And you need very good tools to refactor automatically. Question: I think this technique is a lot more difficult to use with Legacy Code, is it? Answer: Yes, it is more difficult. But you don’t need to use it too often with legacy code. I can use it on legacy code, but first of all I surround the code I want to change, put some interfaces around it, and then use the same steps to generate the code to rewrite it with very small steps in a simpler way. There might be situations where I prefer to rewrite some legacy code instead of refactoring. When using TDD as if you Meant It with legacy code you need to take very small steps, and do a lot of refactoring in small steps, understand the flow of dependency injection and understand the patterns. All these I learned by using TDD as if you Meant it a lot. I think it helps you to refactor better. You have this refactoring muscle. With legacy code you have a lot of primitives and so much misplaced code. Here with new code you have the same, and you need to understand how it makes sense to put it together. So I think you can use TDD as if you Meant It especially for the refactoring part. I’m not getting that far, but I have a stable point of stop, compared to the last episode when the last point of stop was resetting all the changes. For the next episode I know where I need to continue from. This episode is about failure to refactor because of trying to rush to the next step of Triangulation and taking too bigger steps. I sometimes use bigger steps, but I don’t feel comfortable because it can happen that I get stuck and then I revert. In this way I lose a lot of time. I usually prefer to go slower but make sure I have progress. Consider this episode an example of how NOT to refactor. Rushing to refactor can lead to a good result, but most often it leads to a situation where tests fail and we don’t know why. Most often the programmers I work with are rushing to refactor and don’t even observe the side-effects they introduce when they change the code. So they are not refactoring, but instead they are introducing defects because of taking too bigger steps. The most important aspect in this situation is that when I run the tests during the refactoring rush they are most often red. After being on red for 20-30 minutes I feel more and more pressure and I need to take a break. I don’t know what to do next, I feel stuck. The most common reason of getting stuck or having red tests after finishing a refactoring is not using preparatory refactoring. Refactoring flow means I always see a few next steps ahead. Also the most important aspect is that after each small change I run the tests and the tests are always green. Being in a flow feels good, and I often even forget what the time is. So this episode, coincidentally or not it has the number 13, shows refactoring failure because of rushing and not preparing the refactoring. Please watch it and make sure you don’t do the same at home. Next episode will show you a better way to work, in contrast with this one. On the same page you can find more ideas on Evolutionary Design. Teddy bear thanks to Erik Talboom for all the pairing, discussions that lead to so many twists we discovered together with TDD as if you Meant It. When using TDD as if you Meant It we need to have a clear distinction between the test code, and the production code written in the test methods and classes. The more we dissociate the two, the clearer both production code and test code look. During this episode I made the final steps to separate production from test code. This is a final step of the triangulation of a specific concept. When I started triangulating on the concept of Game, I made an analysis on inputs and outputs (called Behavior Slicing and explained in Episode 1), that lead me to write enough tests to be able to understand it. By triangulation in this case I mean adding enough tests to understand the links between the design entities. In some cases I need more tests, in others just a few. And of course the number of needed tests depends also on the experience of the coder. When separating the two, we need to make sure everything is clear from any point of view: class names, package names, code structure in the IDE, etc. The code at the end of the separation needs to look as if we wrote it in a separate way all along. Whether we apply traditional TDD (where we write the test code in a separate file from the production code from the beginning), or we apply TDD as if you Meant It, the code structure needs to look the same. Of course, the design will be very different in many occasions because with TDD as if you Meant It we can zoom more on the simplest design possible. After this whole process of Behavior slicing to refactoring (Episode 3, Episode 4, Episode 5), to clean-up and to extracting production code I need to identify the next design concept to triangulate to. So stay tuned to see the whole TDD as if you Meant It process all over again, but with another concept related to the Game. So clearly not any change in the code is refactoring. During the last few episodes I extracted many design elements from the initial primitives, and this was refactoring. Refactoring is different than clean-up. When cleaning I care about Clean Code, Coding Standards, Clarity, etc. Refactoring is difficult to make when I don’t have Coding Standards, because the duplication is more difficult to spot. Every once in a while clean-up the code so that you can refactor your design easier! The refactoring approach during this episode is mainly focused on design. There are many reasons to do refactoring: improve clarity, design, minimize defects, exploring alternatives, etc. These are the final stages in the TDD as if you Meant It cycle, when the design elements are almost ready to be separated completely from the tests. Cleaning up is important every once in a while. Without a clean code we cannot focus on the essentials, because there is too much mess. By clean-up I mean deleting the unused methods, delete the useless comments that initially were important, having the same structure in the same place, etc. I really like having classes look the same: constants at the top, fields, constructor, public methods, private methods. And also having always the same spacing between methods, parameters, etc. All these have to do with the coding standards I use. Coding standards are useful because they let me focus on what I need to refactor. I can easier see duplication between classes if they are structured the same. During the first episode of this series I added some initial tests where I didn’t cover all the cases. Now it’s the moment to run coverage on the code and check the areas where I am missing tests. My intention was to show you how to fix such a branch that was not covered by tests in the beginning. We can add missing tests even a lot later. So my mistake was intentional, because it’s a mistake I see very often and I wanted to show you what I do in this context. So when you focus only on a metric, like code coverage, you need to know what to expect. You can read more at ISTQB. // I'm adding only positive numbers here! then I will have 100% line coverage and 100% statement coverage. So then I’m done. I have added all the tests, right?! So take care when you use code coverage as a metric, it can trick you into thinking you added all the necessary tests, but if fact you have many missing tests. So the technique of TDD as if you Meant It will give you the context of having full test coverage, but you need to take the necessary measures to make sure. Even from the first episode Pawel Duda told me that I forgot to add a test for the “nobody won” branch. And he was right, I didn’t add the test with the purpose of adding it a lot later and show you how I do this. So when we meet he will receive a prize from me. During this episode you will see how I formulate experiments to decide where it is a good idea to get the design. Evolutionary Design happens during refactoring. This episode is just refactoring, but with a clear purpose. The purpose is to identify, with a clear hypothesis, if a certain design solution would be suitable. The word suitable is very unclear, so when formulating the experiment I want to make my expectations very explicit. There are many reasons to do refactoring. During this episode you will see a refactoring that is focused on discovering (one of) the correct ways to create the design entities. All the structure will be in one place. Structural coherence. If the experiment succeeds, I can take the decision to keep the changes, but only if I am sure I don’t need more proof. And it’s not about lying to myself that the solution is ok. I really need to be honest to myself and if there’s the least doubt, I need to go back, revert the changes and try again by adding more tests. If the experiment fails, I note down the situation and the solution. Either in my head, or I document it somewhere. It is important not to try it again in that context, because it would be waste. I learn a lot more from failed experiments. I understand which are the solutions I should never chose and the solutions that work only in certain situations. If you don’t have at least a few failing experiments it means you are lying to yourself that you found the correct solution from the beginning. After a couple of episodes when I showed how we can get out of TDD as if you Meant It to Traditional TDD. By Traditional TDD, I mean the TDD when you are allowed to create classes and methods before the test. During this episode you will see how I focus on other primitives from the tests, and I add new tests in order to create duplication between the existing tests and the new tests. Then I remove the duplication by following the Rule of Three. Duplication can be of many types, but that is a different topic that I will follow later. During this episode I am focusing on structural duplication, meaning on the string primitives that still exist in the tests. This is the second episode of an alternative evolutionary design approach. During the (Episode 5) I refactored the code to generate a builder. The alternative presented in Episode 6 and 7 is to stop using TDD as if you Meant It for a while and start using some traditional TDD. During this second episode for creating the builder with traditional TDD, I am trying to focus on finishing the problem. This means I am trying to get in a flow state, where everything works well at the end. Also that means that I am often taking bigger steps than what you saw in the first 5 episodes. This is because I consider the risk being smaller, and because I know where I want to get. Because I am focusing on the problem, I am doing more refactoring. And the type of refactoring is faster, in bigger and more direct steps. I want to leave a nice code base behind so I try to have the best code I can for the moment. So then during the next episode I can use this code with ease. At one extreme I am in the point where I know exactly what I need. In this case any form of Evolutionary Design or TDD is useless. I might want to add automated tests (while adding the code or after) to perform the checks on the code just for regressions. At another extreme I don’t know at all what I need, but I have the specs. So I start with them and I focus on the principles of refining the code concepts in order to extract the appropriate design entities. During this codecast I will situate myself very close to the extreme where I know pretty well what I want. But careful to be sure you always introspect and clarify if you have all the information to take a design decision without enough proof. Your solution might be too complicated or just inappropriate. This is the first episode of an alternative evolutionary design approach. During the last episode (Episode 5) I refactored the code to generate a builder. The alternative presented in Episode 6 and 7 is to stop using TDD as if you Meant It for a while and start using some traditional TDD. In a traditional TDD approach I am creating some structures up-front. I can create more or less design up-front, but still the minimum I create is the production class or function I want to test. This approach is different from TDD as if you Meant It where I am extracting the code from the test method, to the test class and to a production class. In a traditional TDD approach we can have different approaches: bottom-up, top-down, middle-top, middle-bottom, etc. But I take this decision depending on the clear need I observe in the current moment. Whenever I start with traditional TDD, I need to define the clear specifications. Or in other terms, I define the clear needs of the design structure I need to add. In this current case I defined the fact that I need a fluent builder. So my current tests will reflect the need in the tests. In this approach the evolutionary part of the design is marginal. As I am very clear with what I need, I don’t need a lot of proof. This is not always the case.